The U of M is retiring Larry Kenon’s jersey. Is it the best choice? I'm happy for Larry Kenon. By the time you finish this column, you may have your doubts. But I really am happy for him. Saturday, when the Memphis Tigers host arch-rival Louisville at FedExForum, Kenon will be given the highest honor an athlete can be given by a team when his uniform number (35) is retired and raised to the rafters. Kenon will join eight other Tiger greats — including two teammates — in the pantheon of Memphis basketball's elite. 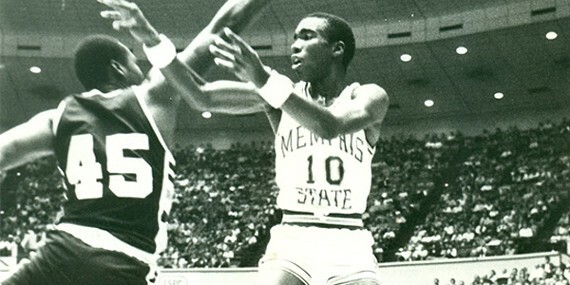 Should you need a refresher, Kenon starred alongside Larry Finch and Ronnie Robinson for the 1972-73 Tiger team — then Memphis State — that advanced to the NCAA tournament's championship game before bowing to John Wooden and Bill Walton of mighty UCLA. Kenon averaged 20.1 points and 16.7 rebounds in 30 games for that legendary team. Kenon's star shone especially bright in the national semifinals when he scored 28 points and pulled down 22 rebounds — his seventh 20-20 game that season — against Providence. He set a Tiger record for total rebounds that season (501) that remains 129 more than any other Memphis player has grabbed. Some of those who saw him play here insist Kenon remains the greatest player to ever wear a Tiger uniform. Trouble is, that was his only season in Memphis. A year later, Kenon was running the floor with Julius Erving and the New York Nets on his way to an ABA championship. He went on to play in three ABA All-Star Games and two NBA All-Star Games as a member of the San Antonio Spurs. Kenon is a great former Tiger, by all measures. But worthy of inclusion in the program's most esteemed fraternity? I have a fundamental problem with college programs honoring players who spend but one season in uniform. Compounding matters, the Memphis program has several players who starred for more than one season, in eras that haven't been honored enough ... or at all. • Antonio Anderson — #5, 2005-09. Anderson remains atop the list of former players who would receive my vote (if I had one) for a retired number. He is the only Tiger to accumulate 1,000 career points, 500 rebounds, and 500 assists. Those are significant numbers, and Anderson is a club of one. He played in more games (150) than any other Tiger. Most importantly, the Tigers won at least 33 games each of the four years he played. That era needs to be acknowledged. • Andre Turner — #10, 1982-86. Impressed with Kenon's single-season rebound record? Turner's career assist mark (763) won't be touched; the second-most in Memphis history is 639 (Chris Garner). The Little General led the Tigers to the Sweet 16 three times and was a late-game hero (twice) in the team's run to the 1985 Final Four. If the 1973 team has three players in the rafters, it's about time Lee is joined by a teammate from '85. • Chris Douglas-Roberts — #14, 2005-08. There have been only three Memphis players to earn first-team All-American recognition from the Associated Press: Keith Lee, Penny Hardaway, and CDR. The first two have had their numbers hanging above the crowd at FedExForum for 20 years. And neither of them played in a national championship game. CDR is 10th on the career-scoring chart and is one of four Tigers to score 700 points in a season. I really am happy for Kenon. Years ago, I interviewed him about his memories of 1973, and he said something every Tiger fan will appreciate: "Memphis has been a great basketball school, from way before I got there up through today." As Kenon's jersey joins eight others in the FedExForum rafters, here's hoping the Memphis program reconsiders a few other deserving honorees. Take down a few of those (non-championship) NIT banners, and there's plenty of room.